Thank you for visiting my website. 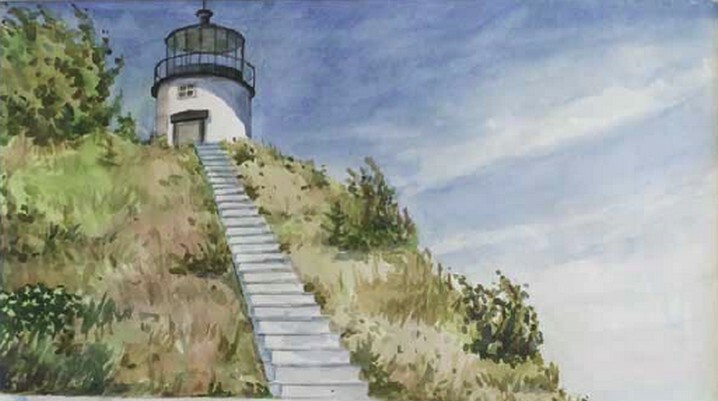 I grew up very much under the influence of two 20th century American realists, Andrew Wyeth and Edward Hopper. 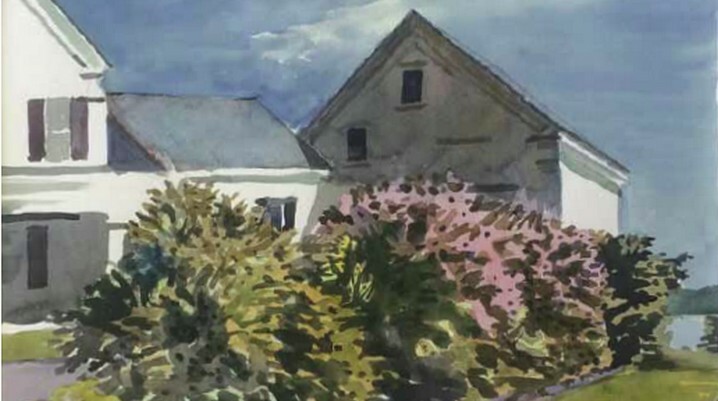 Wyeth was a friend of my father’s, who was himself an accomplished watercolorist, and the fluid early Wyeth watercolors had a profound influence on me. For years I tried to emulate that technique, until I realized that I was incapable of it. Meanwhile, the mood and atmosphere of Hopper’s work became increasingly resonant with me, in part because I have much more of an urban background, having grown up in Cambridge and Boston. Both Wyeth and Hopper offered what I felt was lacking in abstract and experimental art, a strong element of content and narrative. I often wonder what Hopper would be doing if he were painting today. 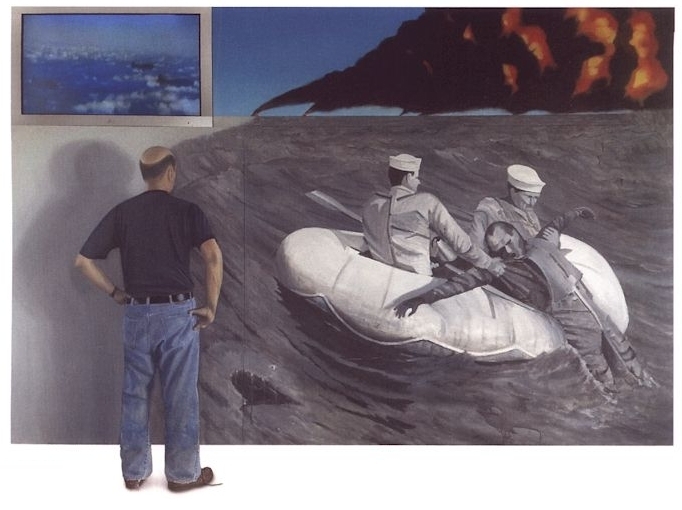 The Rescue of Ensign Gay (above) - oil & acrylic on canvas with plasma monitor 91" x 138"
Frederic Kellogg Summer Workshop - Works in Oil and Watercolor: June 1 - July 7, 2018. 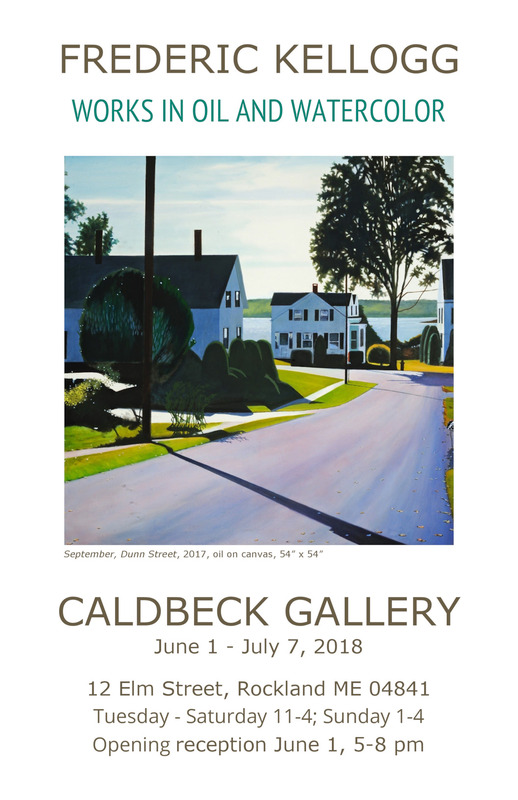 Caldbeck Gallery, 12 Elm Street, Rockland, Maine. Frederic Kellogg at Caldbeck Gallery . 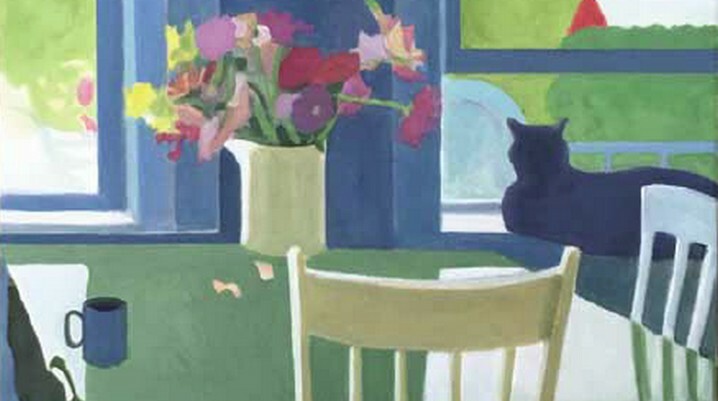 . .
Frederic Kellogg Exhibition - Works in Oil and Watercolor: June 17 - August 13, 2017. American University Museum at the Katzen Arts Center, Washington D.C.
Frederic Kellogg at Katzen Arts Center . 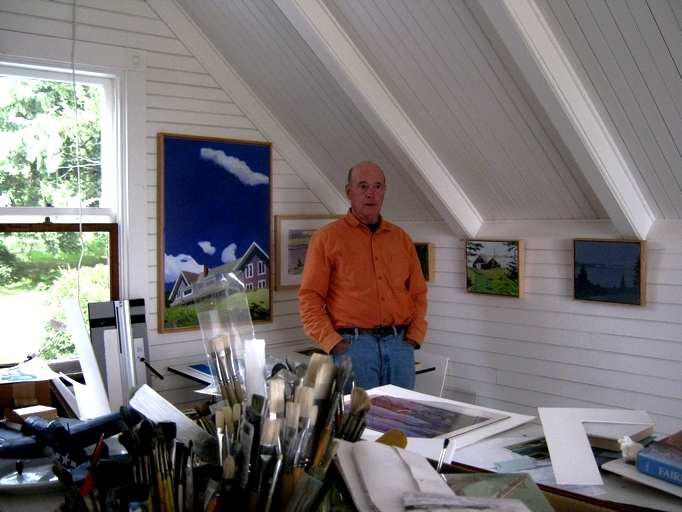 . .
Frederic Kellogg Exhibition - Painting In Maine: August 17 - September 17, 2016 - Caldbeck Gallery, 12 Elm Street, Rockland ME 04841. Opening Reception: Wednesday, August 17, 6-8 pm. 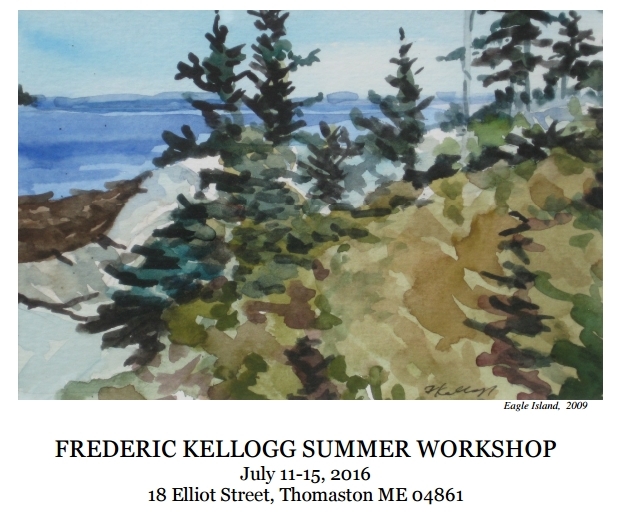 Frederic Kellogg Summer Workshop: July 11 - July 15, 2016. One week of sketching, painting, and critique in mid-coast Maine, in and around Thomaston and Rockland, using watercolor or other media; emphasizing preparation, composition, color, and technique, with individual attention to assure at least one frame-able work. Printable Enrollment Form . . .
Kellogg's recent watercolors represent the culmination of many years of personal discovery and quiet evolution in his painting. They are the most beautiful and accomplished of his output in this difficult medium. Finding typical views around town, he has transformed them through his unique sense of color and light and his sense of the unexpected . . . Frederic Kellogg certainly knows what he is about and he has the courage to extend his inquiry as far as life is willing to take him. Since life itself is something of a mystery and always unfinished, as Edgar Degas observed, this contemporary painter has many more years in which "to do good things." © Frederic Kellogg. All Rights Reserved.